2. Mispronouncing foreign words and then lying about it. I embarrassingly used the French work chic, but pronounced it as “chick” instead of “sheek.” I blame the brand of tight jeans everyone wore to my elementary school in the 1980s for this mistake (see “Chic Jeans” ad below). Despite this excuse, it is still wrong. As I made the mistake in front of only Europeans, I covered it up by lying and saying that “chick” is the way Americans always pronounce chic. 3. Inserting Spanish into Mandarin and visa versa. Unlike French, I did actually study Spanish in school and can correctly say a few things. So when I started studying Mandarin, I instinctively inserted Spanish words to fill gaps in my Mandarin. So, for example, I’d say pero for “dog” instead of gou in the middle of a Chinese sentence. Fortunately the Chinese, unlike the French, are very kind and were usually just pleased I could say much of anything at all. 4. 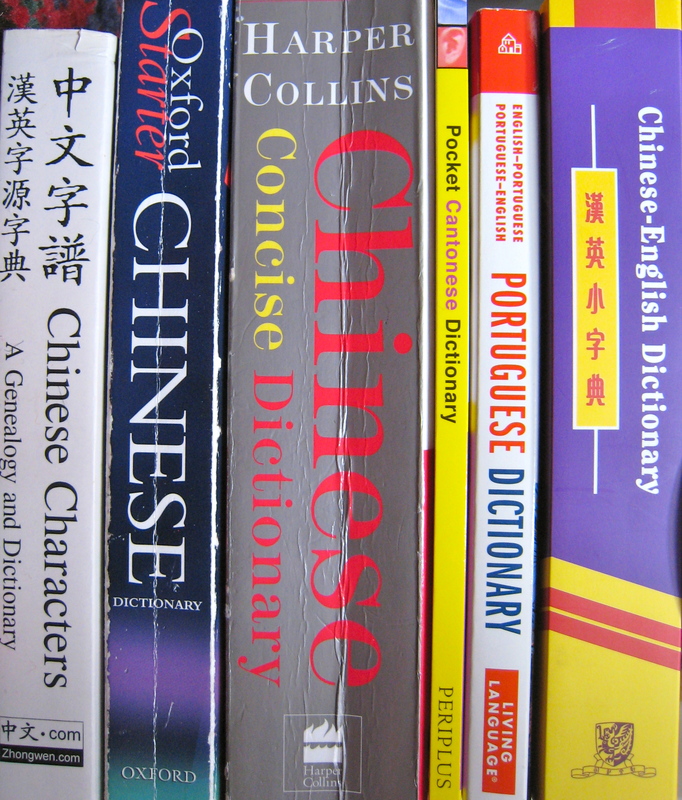 Cantonese is not just “sing-song-y” Mandarin. In Hong Kong, I’m a new learner of Cantonese, which is just similar enough to Mandarin to be a little easy and also very confusing. My biggest Mandarin/Cantonese muddle so far was with two hotel cleaners yesterday. They very sweetly starting chatting to me in body language and Cantonese sprinkled with English about my kids. The basic Mandarin/Cantonese problem quickly reared its head: some words are exactly the same (tricking my brain into thinking and speaking in Mandarin) and some words are completely different (leading the cleaners to wonder what kind of weird mixed up language I was trying to speak). I was basically speaking to them in Mandarin with a sing-song-y Cantonese lilt added to the end of every sentence. They smiled sweetly, obviously thought I was nuts, and quickly switched to their own basic Mandarin to get us through. 5. Full circle: making a mistake with “two” in Cantonese (rather than French). To my ears, the Mandarin number one sounds almost exactly the same as the Cantonese number two. One is a high tone and one is a low tone, but it’s still very, very easy to mix up when you’re trying to think on your toes. I’ve already made this mistake several times, but no one rolled their eyes, I just received less change back than expected. Oh, I love it! Thank you for owning up, and making me feel so much better. I have the horrific habit of speaking back to people in the same accent, which is mortifying for all concerned. Especially when there are people from more than one region in the same room..
Ha! I’ve similarly absorbed a bunch of British English words (some with accent). Rather embarrassing when I’m back in the US. I blame the influence of my daughter who absorbs accents and words like a sponge. 😀 You just made my day! Thanks for sharing! I tend to think that those are the highlights of expat living, it just makes life sooo much more fun – for everybody, I guess! AND I am very impressed with your picking up Cantonese and Mandarin! I can’t imagine how hard that must be. Kudos! And saludos! Don’t be too impressed, while my Mandarin is basic, my Cantonese amounts to about 25 words often mis-pronounced… Plus, don’t you speak Dutch, English and Spanish (and probably fluently?)? I think, an Asian language must be so hard to learn – both when it comes to pronounciation as well as to the reading / writing part! Right then, four European languages…. I’m still impressed. Don’t know how I got it stuck in my mind that you were Dutch…. I understand the difficulties in point 5. Took me a lot of cerebral effort to get the number 1 and 2 distinction between Mandarin and Cantonese! Glad I’m not the only one. I’m also having a terrible time mixing up have/want between Cantonese and Mandarin…. I just speak English in Hong Kong – it stresses out the store clerks and waitstaff. Hey, better they’re stressed than me! Good point. Especially since I bought knock off “Angry Bird” “Crocs” for my daughter from a shopkeeper in Tai Po who spoke (and joked) in absolutely perfect English. I might build up just a tad more Cantonese, and then bail and re-double my Mandarin efforts. I roam through some of your old posts and find them all very insightful and fun. I’ll be back for more. Thanks! 简体 or 簡體, what else is there? The last time I was in Jakarta, I was helping out a Japanese businessman in my hotel lobby. He admonished me for not using polite language (in other words, as if he was my boss). You’re welcome! If you plan on flying with a Japanese airline, see how they apologize to you, and then to a Japanese person. If you forgot your book at 美心 and the TV is broken, that will be some quality entertainment. Food on the mind again, bento? You’re new blog immediately popped to mind when I saw an odd food product in the local Park n Shop yesterday. Something labelled “Hot Cheese Fish Sausage.” It was not in the refrigerated section, but looked just like a package of cheese sticks. It appeared to be of Japanese origin. Ingredients included: white pollack, processed cheese, starch, egg white, salt, sugar, gluten, soya, rice wine, red pepper, and a bunch of E numbers. I feel ill just typing that. Was it http://bit.ly/12gff7D? I reckon it was kamaboko/surimi, processed and cured fish cakes. Even more unusual? Some feller in Japan used one to play the flute. Oh, and apparently there’s a statue of him (http://www.flickr.com/photos/anaguma/5892265637/). I dug your article on Shenzhen being inappropriately termed a fishing village. That’s pretty much how EVERYONE who talks about the modern history of that city starts off. Including you;)? Jonathan, that’s exactly the ‘cheese fish sausage’ I’m talking about. Different brand, but same look. Have you tasted one? I seem to do the same as you with regards to inserting one foreign language to another. If I don’t know the French word I will use the Arabic word and vice versa. Glad I’m not the only one! It’s particularly odd to break into Chinese un the middle of a Dutch sentence! I think every expat can relate!